What happens when 16 contestants are put on a remote island and forced to kill each other? The Culling definitely has tons of moments that all of its players can relate to. Here’s my list of 36 pictures in The Culling that might just make you say “Oh yeah!” It’s a great game with great, bloody moments, all fueled by the game's in-game currency of F.U.N.C, so let's get started. I think you’ve got something on your back. While the chainsaw isn’t exactly a common weapon, it’s definitely the most fun when you do get it. 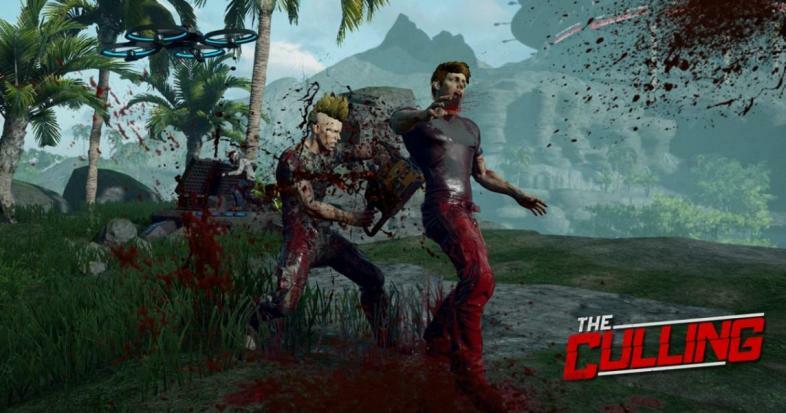 And as this promotional picture shows, the chainsaw is by far the bloodiest, most brutal weapon The Culling has to offer. Nice mask. I think I’ll take it. When one contestant has a shiny, new fire-ax, and the other has a stone axe that’s just sticks and rocks tied together, it’s not exactly a mystery who’s going to win. He may have a pretty mask covering his face, but his weapon just isn’t up to par. But it’s a pretty great feeling when you’re the one with the Tier 4 weapon attacking the guy with the Tier 1. The poster boy for The Culling isn’t messing around. I don’t know about you guys, but this is the picture that sold me. The Culling sounds brutal enough just in its description, but this promotional image seals the deal. But does anyone else wonder how that cigarette stays lit for so long in-game? Fighting one guy’s bad enough… but two at once? Why bother going alone when you can bring along a second murderous psychopath? It’s much easier to slaughter other contestants when you’re accompanied by a friend. After all, the only thing better than one guy with a bloody machete is two guys with bloody machetes. Blocking is just a precaution when murdering someone. That final fight to earn the Victory is always the most heart-pounding. Even with great gear and lots of healing items, it’s possible to have all your work before that point mean nothing. If someone else who wants the victory just as much as you decides to bury an axe in your back, it’s all over. It’s way worse when they have a gun though, believe me. He may be half-health, but look at that loadout. Trying to charge someone with two bows and a blowgun really isn’t going to go well for you. Admittedly, I’m more often the one with the bow aiming at you, so… Sorry, I guess? I'm back! Let me know what you guys think!